Intel CEO Brian Krzanich announced at the Consumer Electronics Show (CES) today that Intel has fabricated a 49 qubit superconducting chip, codenamed Tangle Lake, and has delivered it to partner QuTech in the Netherlands. Previously, they had developed a 17 qubit chip which they announced last October. Intel did not unveil any performance or quality specifications for this chip. Presumably this will require the assistance of QuTech and significant work to measure and characterize the important parameters. So it is not known how Intel’s superconducting technology measures up to that being developed by Google, IBM, Rigetti, and others. As stated by John Martinis of Google at the recent Q2B conference, qubit quality is very important and may perhaps be even more important than the total number of qubits. (See a video of his talk at the Q2B conference here.) We would urge Intel and QuTech to release the technical data when it is available. As mentioned on our Qubit Quality page, IBM and Rigetti have done a very good job of documenting their chips and we hope that Intel/Qutech will do the same. Another interesting aspect of the Intel/Qutech partnership is that they are also working on a spin qubit technology. Spin qubits also have the potential of being fabricated in a semiconductor fab facility but may potentially be more scalable than superconducting chips because they would have a smaller cell size. So far, Intel has not yet announced that they have fabricated any quantum chips using the spin qubit technology. 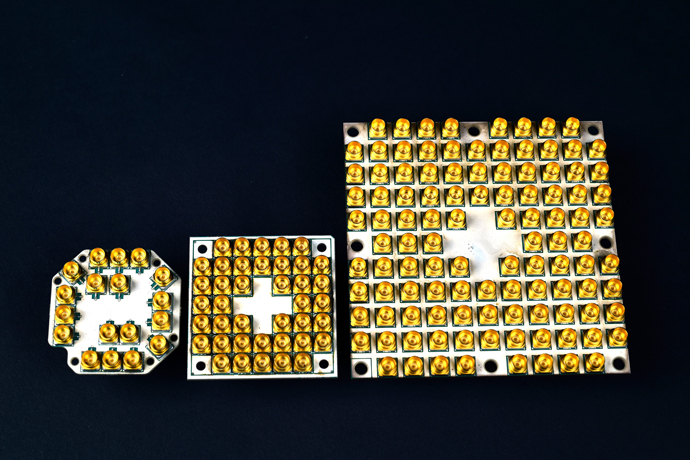 The picture below is supplied by Intel and shows a comparison of the 7 qubit, 17 qubit, and 49 qubits chips that Intel has fabricated. To view Intel’s press release, click here.